c1899 image of shop on Bridge St. This is a terraced three bay, two storey rendered building built c. 1800, has a centrally located round-headed arched Gibbsian door. 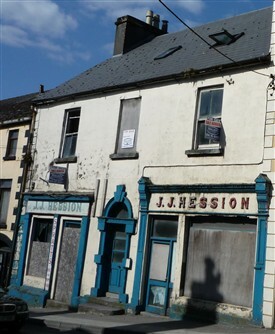 The exterior is interesting as a design for a shop front and according to Mayo Council’s - Features to be Preserved list No 16, “Hession’s has an impressive door-case and the building displays an enormous amount of character. Its shopfront and doorway should be preserved”. Michael Hession, following his parents, once the owners, ran a grocery shop here for many years, decades before supermarkets. 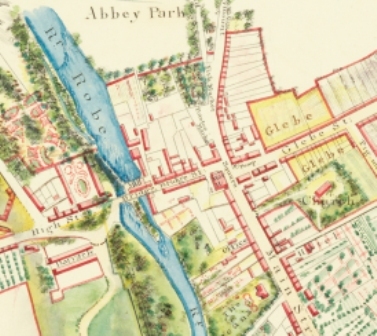 As their son Miachael had trained in London, the exotic often graced his shelves. One had only to pass by, where the waft of freshly ground coffee was a rare and great attraction after World War 11. Many youngsters caught a glimpse of their first banana and orange in Michael’s emporium. After the shortages and rationingduring the war, exciting new products began to creep onto Hession’s shelves. Tea arrived in large chests from India and would be repacked on the premised in half and quarter lbs., packets for resale. Recycling not a new concept! In the past the tea chest itself was a valuable commodity, with many parents using them as the play pen for toddlers. The fabric from the sacks, in which flour was delivered was frequently a prized possession with bags often being sewn together to make sheets. Nothing was every wasted and recycling a way of life then! This page was added by Averil Staunton on 16/12/2010.